Manage your computer and mobile devices from the cloud! 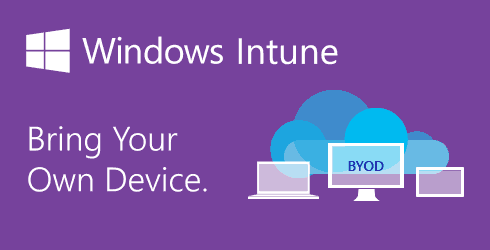 Windows Intune provides a cloud-based administration service that helps keep protected and monitored the computers and mobile devices used by the members of your organization. Implement the “Bring Your Own Device” (BYOD) option so that your employees can use the device of their choice, focus inside and outside of work, and at the same time to help manage their own computers. The administration console based on Windows Intune and Enterprise Mobilty Suite provides simplified management of client computers of the company, including Windows, Windows RT, Windows Phone 8, Apple iOS and Android devices. Download and publish software packages, manage policies and monitor the equipment inventory. Use System Center Configuration Manager along with Windows Intune to manage a broad range of devices. This version supports large-scale implementations in a single administration infrastructure. Eliminate the need to plan and maintain the hardware for installation, and reduce the IT workload with applications and downloads via self-service portals. Monitor your devices through the cloud with the integrated compliance and security you need. Use the integration of Active Directory and Microsoft Azure, available under subscription, to allow rapid implementation without local infrastructure. Manage business and personal devices in a better way, allowing remote deletion of data to help protect your business information; get access to the self-service portal so that people register and manage their own devices. Improves efficiency and reduces complexity. Protect sensitive information contained in your computers and mobile devices. Safety in corporate and employee devices; get an environment that includes comprehensive update and policy management. Empower users without excessive costs.